When you suspend a chain from two hooks and let it hang naturally under its own weight, the curve it describes is called a catenary. Any hanging chain will naturally find this equilibrium shape, in which the forces of tension (coming from the hooks holding the chain up) and the force of gravity pulling downwards exactly balance. 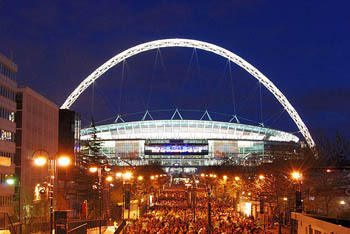 The arch above Wembley Stadium is an inverted catenary. Image: Rob, CC BY 2.0. Something beautiful happens when you turn a catenary curve upside down. The inverted catenary will now describe an arch — and it turns out that it's the most stable shape an arch can have. In a hanging chain the forces of tension all act along the line of the curve. In the inverted catenary the forces of tension become forces of compression. And since these forces are directed along the line of the arch, the arch doesn't bend or buckle. If you want to build an arch, you should make sure it contains the shape of an inverted catenary. That way it will stand freely under its own weight and you'll also need to use a minimal amount of materials. The English architect Robert Hooke was the first to study the catenary mathematically and in 1675 published an anagram (in Latin) of : "As hangs the flexible line, so but inverted will stand the rigid arch." The arch above Wembley Stadium has the shape of a catenary and Christopher Wren also intended to use it in St. Paul's dome (find out more here). This gives a whole family of curves, one for each value of the parameter , which determines the width of the catenary and also its lowest point above the -axis. Use the Geogebra applet below to see catenaries for different values of a>0. When children play with a rope, where two hold each end, move the rope up and down and another jumps in the middle, is the shape of the rope a catenary while moving? As with suspension bridges, when the forces ( usually a road deck) on the rope are high enough that the mass of the rope is negligible, the curve is parabolic. If the children twirl it very fast it will tend to a parabola, slower and stationary, a catenary.